You know just by looking at me that I am not rock star material. The only piercings I have are in my ears. I do have highlights in my hair; but they are an ordinary blond, not pink or purple or blue. I don’t have a tattoo…not even one. When people asked me what my major was in college, they nodded sagely when I said education. “You look like a teacher,” they would tell me. Well, apparently Emmy feels like I have Rock Star potential. She gave me the requisite tissue paper flowers for Mother’s Day; but she also came up with a present on her very own. Now I, too, can be a ROCK STAR!!!! Emmy’s kit provided me with necklaces, bracelets, a ring, stick-on gems for my face, and a tiara (what rock star doesn’t have a tiara?) Lily suggested that a Rock Star isn’t a Rock Star without sunglasses. 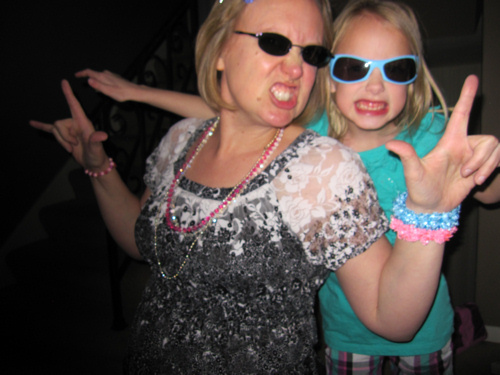 So we donned our shades and scowled, trying out our best Rock Star sneers and lip curls. After all, who doesn’t want to be a Rock Star, baby? I love it! How clever. I love this! What a great gift your little girl came up with, so creative! That is awesome!!! Daughters are so much fun and they always have such awesome ideas for gifts! I hope you enjoy being a rock star! What a creative girl, that's awesome! Ah, but rockstars come in all shapes in sizes! You two look fantastic! What's your rockstar name by the way? Haha that's awesome! What a great picture, and I love that she sees the rockstar in you! Pretty cool gift you got! The rockstar family 🙂 I love gifts like these more then something they can buy. You know they do have non permanent pink, purple and blue hair dye – just kidding lol! Looks like a fun Mother's Day! Wow, that is the best Mother's Day gift ever! I love this! So unique and creative. Your daughter rocks and so do you! Awesome Mother's Day gift and adorable picture. So, are you going to wear those stick-on gems anywhere special? My recent post Operation Trampoline: Bounce, Bounce, Bounce! LOL… what an awesome gift! I love thoughtful gifts like that! Did she come up with that all on her own, or did her daddy help her?